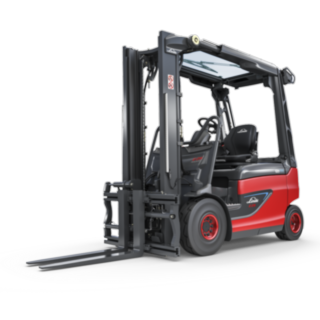 In 2016, Linde Material Handling developed a true innovation in the form of the Roadster: It is the world’s only electric forklift truck to offer an almost unrestricted view of the load and the surrounding area. This is all made possible by the truck’s unique construction without an A-pillar and with a panoramic roof made from reinforced glass. Linde is constantly redefining what is possible, while always keeping the customer’s needs in focus. That’s why we have now developed a special edition of the Roadster: The Perfect Truck. And what does this Perfect Truck look like? The features make all the difference, combining unparalleled and proven technology with additional assistance systems and attachments, along with our latest safety solutions. 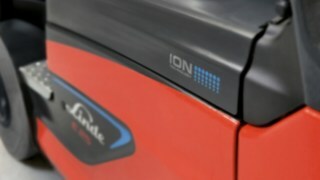 The truck’s features include the Linde TruckSpot, LED stripes, an integrated fork positioner (IZVG), the Linde Safety Pilot active, CS20 tires, a reinforced glass roof, and, of course, a lithium-ion battery. We aim to provide you with everything you need in one truck. The Perfect Truck far exceeds the sum of its parts. The tried-and-tested technology is complemented by coordinated features that reflect our ultimate objectives: maximizing visibility, safety, and productivity. Thanks to its unique design, the Perfect Truck offers an almost unrestricted view of the work area, load, and surrounding area. 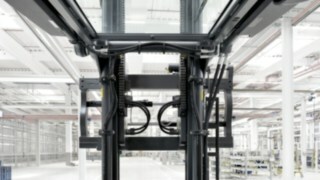 This is possible because the cab roof is connected to the lift mast directly above the tilt cylinder. The A-pillars are no longer included, offering an unobstructed panoramic view. 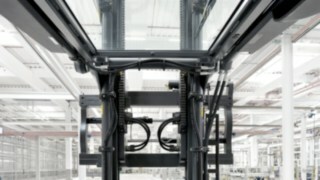 For optimum visibility, the Roadster is also equipped with a unique feature: The world’s largest panorama reinforced glass roof is an innovation in forklift truck construction, which gives the driver a clear view above their head. 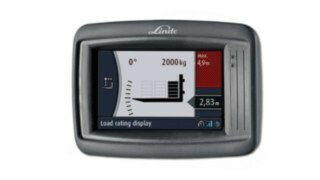 The Linde Safety Pilot active ensures additional safety on board. 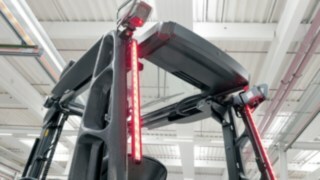 The revolutionary assistance system helps the driver to avoid operating and driving errors. It regulates the lifting and tilting function according to the lifting load and height, provides support when working at close to the maximum load, and increases load handling safety. It records data such as lifting height, fork tilt, and load weight for all driving and lifting maneuvers and analyses potential risks. A monitor in the driver’s cab shows the driver all the important parameters. The maintenance-free Li-ION technology is extremely energy-efficient and operates without emissions. Fast interim charging eliminates the need for time-consuming battery changes, maximizing the availability of the trucks. The complete system – truck, battery and charger – offers a harmonized solution. The Li-ION technology is suitable for all application areas, but its advantages particularly come to the fore in intensive applications such as multi-shift operation. The LED stripes on the mast and at the rear of the truck ensure improved vision and increased safety. The two-colored light strips illuminate the working environment evenly and over a wide area, and enable safe, precise, and productive work in any surroundings. The lights switch between white and red, indicating the direction of travel and provide additional safety for pedestrians and other road users. 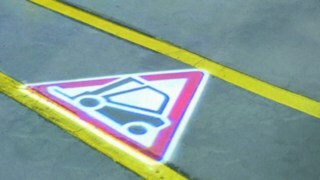 The TruckSpot optical warning system signals that a forklift truck is reversing by projecting a large warning symbol onto the floor behind the truck. The red triangle with the forklift truck symbol is intuitively understood the world over as a hazard warning. When reversing, the truck projects this warning sign. In corners, entrances and at confusing junctions, pedestrians and other drivers will see the warning sign long before the forklift itself and can react quickly. The integrated fork positioner, IZVG VIEW, offers a better view of the load and the surrounding environment. It increases the driver’s field of vision by more than ten percent in typical usage situations and enables a better view of critical points in the working area. IZVG VIEW minimizes the restriction of the driver’s view, so the all-round visibility of the Perfect Truck is retained despite construction equipment. 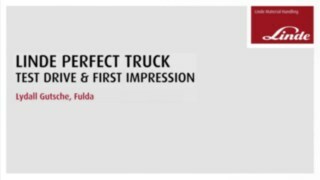 The Perfect Truck is fitted with CS20 tires from Continental. Thanks to their double-L profile with closed shoulders, they guarantee extremely precise steering and cornering behavior. 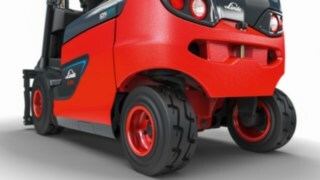 Their special blend of materials also reduces rolling tire noise and vibrations. Reduced rolling resistance enables increased mileage with reduced energy consumption. As such, the CS20 ensures productivity, safety, and increased driving comfort.